Humber graphic design faculty, students and alumni used their talents to support Japan at a special event in downtown Toronto. Humber Multimedia Design Production Technician instructor Linda Nakanishi organized To Japan With Love, an event where designers showcased their abilities by creating Japan-themed designs for posters and art cards. 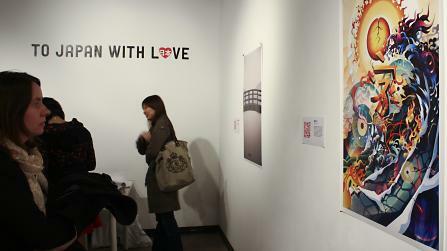 Hundreds of people attended and gave donations, as well as purchasing posters and art cards. The event raised more than $3,200 after expenses, which will be donated to the Canadian Red Cross. The March 11, 2011 earthquake that rocked northern Japan, and the subsequent tsunami, killed more than 15,000 people and left thousands more injured or missing. Thousands of homes and other buildings were destroyed, and a potential nuclear emergency continues to threaten the area. Nick La, a well-known graphics designer and a graduate of Humber, was one of the people Nakanishi contacted. He had started thinking about what he could do to support Japan as soon as he heard the news. “It really hit me emotionally, and I wanted to do something to help them, to help people and express my feelings,” he said. For Yuko Itakura, who grew up in Japan before coming to Humber to study graphic design, the cause is especially meaningful. She designed her poster as a way to communicate to people what needs to be done to support Japan. Her brother, who lives in Tokyo, told her of the struggles people there were having with necessities such as bottled water, toiletries and electricity. “Japan is my country. I was born in Japan, so I really love Japan,” said Itakura. Nakanishi is hopeful that people will continue to support Japan. “I created a web site called ToJapanWithLove.ca, and it’s going to grow as a place to go to buy art to support this cause, so it will continue,” she said. Visit ToJapanWithLove.ca to purchase art, see the designs and learn more about the designers.